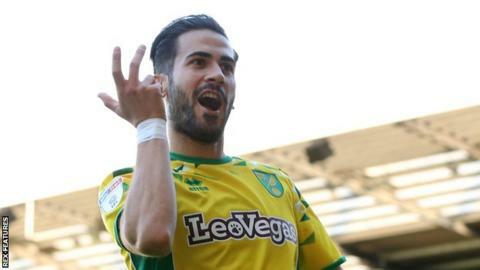 Mario Vrancic scored a late penalty to defeat Wigan Athletic and extend Norwich City's winning run. The sides looked to be heading for a stalemate at Carrow Road before the home side's Finnish forward Teemu Pukki was held back in the box with less than five minutes to play. Bosnian midfielder Vrancic made no mistake from the resulting spot-kick and Paul Cook's Latics were unable to find a response. The Canaries have now won five consecutive matches in all competitions - claiming 13 Championship points from a possible 15 in September. Wigan had arrived in East Anglia buoyed by back-to-back league victories at the DW Stadium, but this result - in which the Latics failed to register a shot on target - was a third straight Championship defeat away from home. Cook's side slip out of the top six and down to eighth, while Daniel Farke's Norwich climb to fifth. "I'm very happy. To have consistency in the results with so many games is really pleasing. It was a hard-fought win. "We showed our will to win today. When you have this desire and commitment and togetherness you can reach extraordinary things. "The league table doesn't mean anything to me at the moment. It's important to have had a good start, but it's important to go on with this. We have to win as many points as we can get." "When the referee awarded the penalty I felt game was petering out into 0-0 draw, with two teams cancelling each other out. "We got into some great positions in the final third and did a good job pressing them up the pitch but our end product wasn't great. "I did think the incident in the first was a penalty if I am being honest but after that we always wondered if another opportunity came along the referee would give it, and that's what happened." Match ends, Norwich City 1, Wigan Athletic 0. Second Half ends, Norwich City 1, Wigan Athletic 0. Cheyenne Dunkley (Wigan Athletic) wins a free kick on the right wing. Mario Vrancic (Norwich City) wins a free kick on the right wing. Foul by Moritz Leitner (Norwich City). Callum Connolly (Wigan Athletic) wins a free kick in the attacking half. Attempt missed. Callum Connolly (Wigan Athletic) header from the centre of the box is too high. Assisted by Josh Windass with a cross following a corner. Corner, Wigan Athletic. Conceded by Moritz Leitner. Substitution, Wigan Athletic. William Grigg replaces Sam Morsy. Goal! Norwich City 1, Wigan Athletic 0. Mario Vrancic (Norwich City) converts the penalty with a left footed shot to the high centre of the goal. Darron Gibson (Wigan Athletic) is shown the yellow card. Penalty conceded by Callum Connolly (Wigan Athletic) after a foul in the penalty area. Attempt blocked. Marco Stiepermann (Norwich City) left footed shot from the centre of the box is blocked. Assisted by Teemu Pukki. Attempt saved. Teemu Pukki (Norwich City) right footed shot from the right side of the six yard box is saved in the bottom right corner. Assisted by Marco Stiepermann. Delay in match Nick Powell (Wigan Athletic) because of an injury. Substitution, Wigan Athletic. Callum Connolly replaces Lee Evans. Substitution, Norwich City. Jordan Rhodes replaces Emiliano Buendía. Corner, Norwich City. Conceded by Reece James. Louis Thompson (Norwich City) wins a free kick on the right wing. Offside, Norwich City. Jamal Lewis tries a through ball, but Moritz Leitner is caught offside. Moritz Leitner (Norwich City) wins a free kick on the left wing. Substitution, Wigan Athletic. Darron Gibson replaces Joe Garner. Substitution, Norwich City. Louis Thompson replaces Maximillian Aarons. Substitution, Norwich City. Mario Vrancic replaces Todd Cantwell. Attempt missed. Alexander Tettey (Norwich City) right footed shot from the right side of the box misses to the left. Assisted by Emiliano Buendía with a headed pass. Attempt missed. Todd Cantwell (Norwich City) right footed shot from outside the box misses to the right. Assisted by Teemu Pukki.